It’s very tempting to wear that pair of stilettos on party night but going through the same excruciating pain every time you wear high heels could be a sign that you need help. The “long legs” effect is temporal, where the damaging effects of high heels on your back, hips, knees and feet may be long term. The common complaint is pain. Its source could be from your bones, ligaments, tendons, muscles, fascia, toenail beds, nerves, blood vessels, or even skin. Considering where the location of your pain and with a thorough assessment of your body, experts can understand and nail the root of your problems. There are various treatments you may want to consider in favour of high heels. Postural correction exercises, joint mobilisation, stretching and strengthening exercises may prove beneficial for your back, hips, knees and ankles. Applying ice on Achilles’s tendon, massaging your foot will increase blood circulation and reduce swelling especially at the back of your heel or the ball of your foot. Ice pack should be applied for a maximum of 10-15 minutes otherwise the effect will be reversed. Ultrasound therapy can also help enhance the healing process of your inflamed tendon by improving circulation. Mobilizing the joints of your body addresses any limitations in movements. This helps short and tight muscles, soft tissue restriction, joint capsule restriction, motor control problems, joint range of motion dysfunction and nerve-related issues. Extended wear of high heels may shorten your calf muscles. Therefore, the best way to address calf tightness is to use a heat pack on your calf muscles to reduce pain, soothe and improve its blood supply. You could also use a foam roller to relieve tightness. Simple calf stretches against the wall would also help, hold each stretch for at least 30 seconds. Take the support of the wall, with the leg to be stretched kept straight at the back. Bend the front leg leaning into the wall causing a stretch to the calf muscle of the back leg. Hold position and repeat for at least 3 sets. You could see a podiatrist and invest in customised insoles if you have heel pain. Otherwise, off-the-rack silicone metatarsal pads will also help to protect your forefoot. You basically want to provide as much cushion to your feet as possible to reduce and absorb impact. Applying a cold compress over the bunions will reduce pain and swelling. Padding over the bunion will help prevent friction. 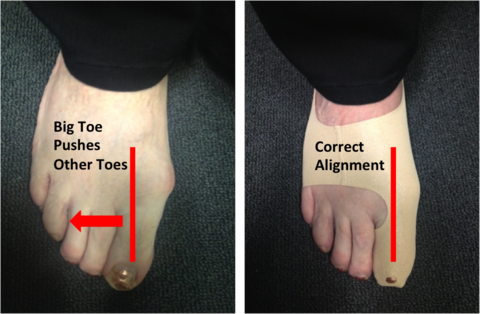 Corrective orthosis footwear will straighten the toe and put it in its correct alignment during recovery. Rest, ice and avoid weight bearing. Ultrasound therapy can be used to reduce pain and enhance healing. Metatarsal mobilisation is also recommended for improving the range of motion. Use metatarsal pads for relief of pain while standing. Avoid wearing strappy heels. Soft-backed shoes or going barefoot helps reduce the friction around the area. Use heel pads to cushion the heel or underneath the heel to lift it up and reduce pressure when walking. Applying cold compress, doing calf stretches and trying ultrasound therapy over the Achilles tendon attachment will help. Kinesio taping is a technique used to support your foot structures and promote the natural healing process without restricting the joint range of motion. It lifts the skin to help with drainage and prevent circulatory swelling. Pain in the front of the knee and low back pain is common due to postural adjustments caused by high heels. A rest from high heels, pain relief treatments, mobility exercises, stretching and posture correction would be necessary. It is best to get professional advice and assessment of your back and knees to help determine the severity of your pain and its causes. Although there are several techniques to treat the cause of your pain, prevention is always better than cure. In fact, it’s always good to get your pain managed before it gets disabling and cripples your lifestyle.